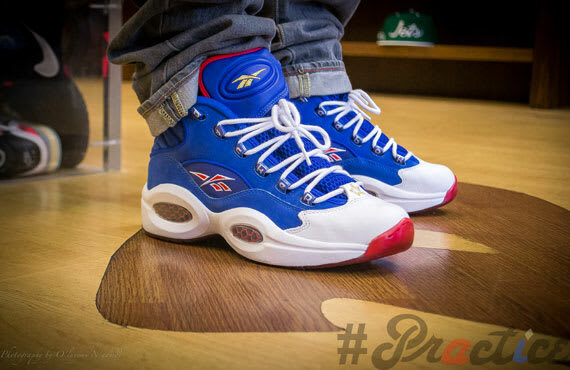 Packer Shoes x Reebok Question "Practice Edition"
You&apos;ve seen the clip — which is still rather classic to this day — and to coincide with said footage as well as the resurgence of the Reebok Question, New Jersey&apos;s Packer Shoes has joined forces with the brand to create a coinciding "Practice Edition" of the mid-cut hoops model. The predominantly blue and white pair is accented with touches of red and gold, as "7" and "6" detailing has then been implemented on the heels, which are a clear nod to AI&apos;s ties to Philly. Scan through the above imagery to get a feel for the forthcoming commemorative take and check back for more on this October release from Reebok and Packer Shoes.